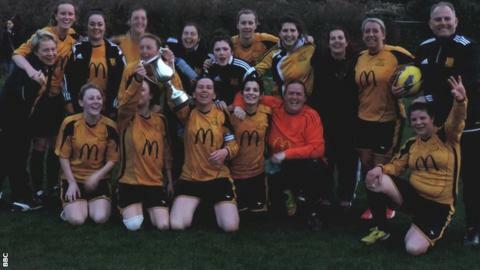 St Paul's were crowned Jersey women's champions again in an exciting climax to the title race in the island. Two goals from Catarina Alvez and one from Jemma Daniel helped them to a 3-3 draw with second-placed St John, who led three times but were pegged back on each occasion. St Paul's went into the game knowing that they would clinch the title if they avoided defeat. St John needed a win to force an extra play-off match to decide the champions. They went ahead when Welsh international Jodie Botterill scored direct from a corner, but Alves pulled her side level just before half-time. There was still time for Botterill to grab her second in stoppage time though to give St John the advantage at the break. Soon after the restart it was all square again when Daniel made it 2-2, before Marta Asencao's goal gave St John renewed hope of setting up a play-off. Alvez, though, had other ideas and her low shot on the hour mark bobbled in at the far post for the goal that ultimately proved enough for the title-clinching draw. "It's probably the most stressful game I've had," St Paul's manager Sara Vasse told BBC Radio Jersey. "We know when St John come here or we play them it's going to be a really tough game. "We went behind three times and we just showed a lot of spirit to come back and keep fighting."